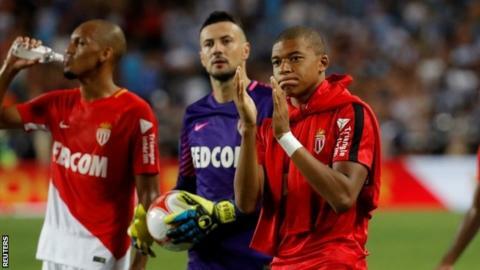 Ligue 1 champions Monaco did not miss forward Kylian Mbappe, who was left on the bench as they thrashed Marseille. French media reports claim that Mbappe, 18, is set to join Monaco's title rivals Paris St-Germain for £166m. Kamil Glik opened the scoring before Radamel Falcao's double, including one from the penalty spot, took his tally to seven goals in four league games. Adama Diakhaby and Djibril Sidibe made it 5-0 and Remy Cabella scored a consolation before Fabinho's penalty. Match ends, Monaco 6, Marseille 1. Second Half ends, Monaco 6, Marseille 1. Offside, Marseille. Florian Thauvin tries a through ball, but Hiroki Sakai is caught offside. Jorge (Monaco) wins a free kick in the defensive half. Attempt missed. Rony Lopes (Monaco) left footed shot from outside the box is close, but misses to the left. Assisted by Guido Carrillo. Attempt missed. Florian Thauvin (Marseille) left footed shot from outside the box is close, but misses the top left corner. Assisted by Andre Zambo Anguissa. Attempt saved. Youri Tielemans (Monaco) right footed shot from the centre of the box is saved in the centre of the goal. Assisted by Rony Lopes. Andre Zambo Anguissa (Marseille) wins a free kick in the attacking half. Foul by Guido Carrillo (Monaco). Substitution, Monaco. Almamy Touré replaces Djibril Sidibe. Goal! Monaco 6, Marseille 1. Fabinho (Monaco) converts the penalty with a right footed shot to the bottom right corner. Penalty Monaco. Jorge draws a foul in the penalty area. Substitution, Marseille. Andre Zambo Anguissa replaces Morgan Sanson. Goal! Monaco 5, Marseille 1. Rémy Cabella (Marseille) right footed shot from very close range to the centre of the goal. Assisted by Florian Thauvin. Attempt missed. Florian Thauvin (Marseille) left footed shot from the left side of the box misses to the right. Assisted by Maxime Lopez. Attempt blocked. Rémy Cabella (Marseille) right footed shot from the left side of the box is blocked. Assisted by Florian Thauvin. Attempt blocked. Falcao (Monaco) right footed shot from the centre of the box is blocked. Assisted by Djibril Sidibe. Foul by Rémy Cabella (Marseille). Goal! Monaco 5, Marseille 0. Djibril Sidibe (Monaco) header from the right side of the six yard box to the bottom left corner following a corner. Kamil Glik (Monaco) hits the right post with a header from very close range. Assisted by João Moutinho with a cross following a corner. Corner, Monaco. Conceded by Grégory Sertic. Attempt missed. Florian Thauvin (Marseille) left footed shot from outside the box is too high from a direct free kick. Corner, Marseille. Conceded by Danijel Subasic. Attempt saved. Florian Thauvin (Marseille) left footed shot from a difficult angle on the right is saved in the centre of the goal. Assisted by Morgan Sanson. Substitution, Monaco. Youri Tielemans replaces Adama Diakhaby. Attempt missed. Luiz Gustavo (Marseille) left footed shot from outside the box is close, but misses to the right. Attempt saved. Morgan Sanson (Marseille) right footed shot from the centre of the box is saved in the bottom right corner. Assisted by Valère Germain. Maxime Lopez (Marseille) wins a free kick on the right wing. Rémy Cabella (Marseille) wins a free kick in the defensive half.